The athlete’s quest for a magic pill, secret weapon or instant success is as old and as earnest as the quest for the Holy Grail. In our sport we are always looking for whatever will give us an edge to better our personal best lifts or win titles. One way is to find out what is the common thread that characterizes the performance of all the great powerlifters of the past and present – male or female, regardless of weight class or lifts accomplished. People like Don Reinhoudt, Bill Kazmaier, Anthony Clark, Jon Cole, John Kuc, Jim Williams, Rick Gaugler, and Dawn Sharon – no name a few. 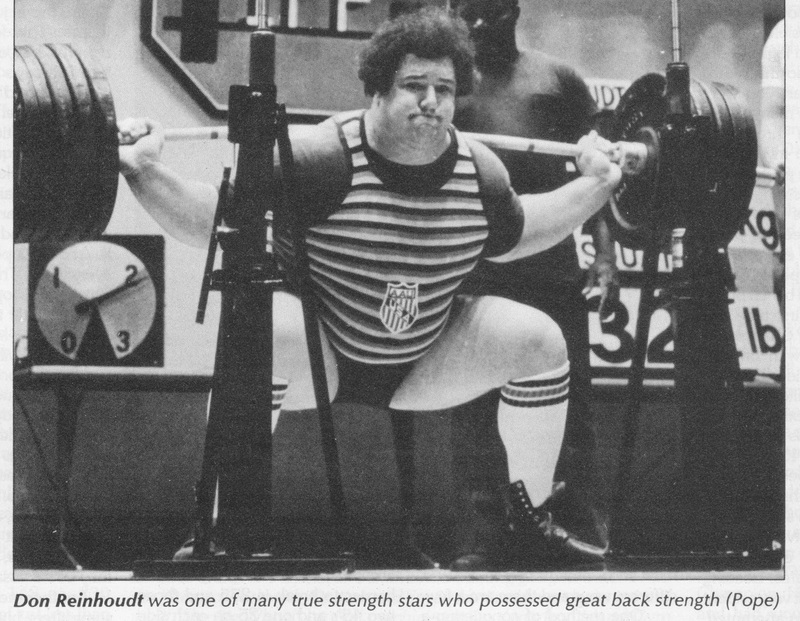 All the above lifters excelled in all three lifts at an all-time-best-level. What is one common secret of their success? Obviously, argument can be made that all the athletes above are genetically gifted with exceptional leverages, ability to build and maintain muscle mass, and recovery rates that allow phenomenal work volume/frequency. All the above lifters possessed phenomenal back development that enabled them to develop freakish strength and that strength is integrally incorporated into the form and mechanics of their lifts. In general, we can identify two groups of lifters by their training philosophy. The first group likes to 'keep it simple', almost taking for granted the edge that they have on their competition, and they get away with setting world records without paying extra attention to further build and strengthen their backs. The second group doesn't leave these things to chance and pays close and detailed attention to their backs. The second group trains their backs from a multitude of angels in a disciplined attempt to create the greatest foundation of back strength and versatility. The difference between the two groups is considerable. Athletes from the first group tend to have either short careers or they peak early in their careers, allowing their genetic gifts to determine their top level of performance. The second group has the opportunity to enjoy a long career with slowly but continuously evolving levels of performance. Any athlete looking for a legal edge on the competition cannot ignore the potential benefits of increased leverage and strength through specific back training. Before we get down to what you need to do to develop your full back potential, let's find out what we have to deal with. The musculature of the back os much more than lats and traps! In this article we will attempt to logically break down the musculature of the back into groups. We will then outline key movements that can be employed to train these groups to a level where we can break through our plateaus and chase our dreams. Do not be frightened by the technical terminology. Try to add key movements into your training to strengthen your weak points. The first group is composed of the muscles of the back that function to stabilize and locate the upper arm. This first group includes the lats (latissimus dorsi), and the shoulder rotator muscles: the subscapularis, supraspinatus, infraspinatus, teres major and teres minor. These are all back muscles that should be worked religiously, yes, in a scrupulously faithful manner, both separately and in different compound movements. The second group is made up of the traps (trapezius), the rhomboids (rhomboideus major and minor) and levator (levator scapula). All of the muscles of these first two groups are situated in your back and work together, as a team, to locate, coordinate, and stabilize all movements of the arms and shoulders. I powerlifting, all three powerlifts are performed with the aid of these two groups of muscles working as stabilizers. A bar will feel lighter on your back as you walk out and perform a squat when these groups are well developed and conditioned. Watch a deadlifter round his shoulders forward and miss a lift and you will know that these two muscle groups are not strong enough to hold proper leverage as he drives through his lift. A bench press is well coordinated, properly tied, and in the groove when these two groups are properly balanced in strength and execution. The key is proper balance of strength, size, and range of motion. You need to practice training movements that work in a variety of planes of motion and maintain proper alignment of the shoulder blades throughout these movements to create the conditions where you will see dramatic changes in your ability to perform the big three powerlifts. Working simple and heavy will only work if you have tremendous luck and genetic gifts. No one can find their true peak performance without paying their dues in accessory movements. This article is devoted to exercises that work muscles of these first two groups and how they can be used. At Power Excel we frequently divide back training into upper back and lower back. If you work out two to four times per week you will probably find it efficient to work these first two groups, the upper back, together with chest and shoulders. As I previously stated these groups stabilize movement of the upper arm and shoulder blades and will be getting serious work in any chest and shoulder workout. Lats are primarily worked in Lat Pulldowns, Chins, and Rowing motions. The shoulder rotators are worked with pressing movements of all types, dips, lateral raises, front raises, shrugs, and upright rows. The key again is to employ a variety of different motions, angles, and hand positions to fully develop each of the muscles. One key training position is where the shoulder blades are pulled back and held down during the execution of the following movements. This position, where the shoulders are pulled back and at the same time held down toward the hips so that your traps are long, is the strongest functional leverage position for almost every movement and is most certainly the best position for successful execution of the powerlifts. This brief example of the variety of Lat Pulldown movements serves to illustrate the innumerable potential of each of the primary accessory exercises for upper back. Each change in angle or hand position results in a different balance of stabilization in the first two muscle groups. The more angles you work the broader your foundation for power. In simple terms, you will be able to push through a larger 'groove'. You will be able to adjust to changes in balance, equipment, and conditions. This broader power base will allow you to work harder in primary powerlift exercises, and complete more reps with a given weight. You will make renewed gains and complete more contest lifts than would otherwise be possible. In a future article we will address different upper back training routines guaranteed to improve your foundation and allow you to push harder through a peaking cycle to a higher total.